One of the most common questions about crime prevention is about neighborhood watch. Many people want to know how to start one. This is a great question. I think many will be surprised how easy and fun it is to start a neighborhood watch. Determine the area you want to organize (the larger the better). Talk to surrounding neighbors and find out how many want to assist and participate (8-10 households is a good number). 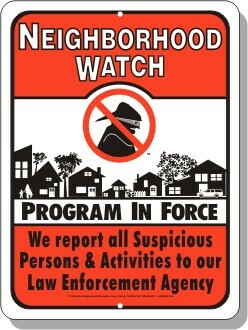 Set up a free neighborhood watch website to coordinate your efforts. 1. Contact your local police/sheriff’s department to schedule speakers for your neighborhood watch group. Make sure you pick a location to accommodate your group and presentation (grange, hall, school, etc). 2. Invite your neighbors. Get a name, phone number, and email list. Send out flyers about two to three weeks before your presentation meeting and then follow up with a “reminder” a couple of days before. 3. Prepare a neighborhood map. This map should have the houses, names, and phone numbers of each household. 4. Benefits of the presentation. You will learn how to develop a plan of action, crime prevention techniques, personal safety, how to report suspicious activity, meet your neighbors and develop a communication network, order neighborhood watch signs, and recruit your coordinator and block captains. 5. Maintaining your neighborhood watch plan. Keep your plan on track with meetings, neighborhood outings, and a monthly newsletter, website or blog. The age-old saying, “If it seems to be too good to be true, then it probably is” holds true most of the time. Has this every happened to you or someone you know? 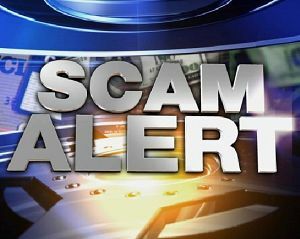 You receive a call or letter from a so-called broker offering some type of investment tip. It can actually be a well-scripted, elaborate scam. First they get your confidence because they state they don’t want any money from you, etc. Then after the third or fourth phone call or letter, they have a great opportunity with no risk to you for a certain $$$. In this day and age, money is tight, taxes are high, and budgets are being squeezed. We all want to make more money to give family and ourselves a little breathing room and some financial freedom. Ask for references on any broker or financial group you’re considering investing with and actually call these references. Make sure that your broker answers all your questions. Know when to hang up the phone. Ignore unsolicited calls. Never give out ANY personal information, even if they say they are representing your bank or credit card company. Take the time to really look at the proposal. Don’t make a quick, hasty decision. Allow it to sit and do your homework. Always shred and carefully store any credit card receipts. Make it a habit to always review your credit card statements each month. 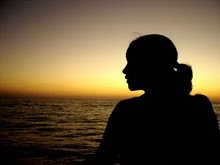 Take a step back and know when you’re the most vulnerable. If you’re in a vulnerable situation, it can make it easier to fall victim to a scam. Know exactly what you’re investing in and take the necessary steps outlined above before you act. Don’t let fear drive your investment. Be wary of something that you want to hear. Anyone who is trying to sell something, even the legitimate ones, know how to make a hard sale based on people’s hopes and dreams. Listen, but make your decision on the entire picture with the “worst case” and “best case” scenarios. Remember, if it seems to good to be true, it probably is too good to be true. It’s generally best not to buy on a “hot tip” or when it’s offered to “only a select group of people”. Do your homework and only make investments that you can afford and afford to lose. Finally, if you believe that you or anyone you know are being targeted for a scam, REPORT IT immediately to law enforcement.